Two o’clock on a Sunday afternoon, and yet for me, the day is only beginning. Everyone was out this morning, so I had the house to myself. I lay in bed, enjoying the unusual sound of silence and listened to two and a half albums on the iPod. The mother had brought the child down to Youghal for a tennis tournament, and my dad was out at a football match. Blissful peace for the day, or so I thought. On exiting the shower though, I heard the dreaded sound of a car engine. Peace was destroyed. The mother and child were home. So now I’m here, doing nothing much. That’s the thing about Sundays, they’re sort of ‘nothing’ days. Friday night you go out, Saturday’s for town and maybe out that evening. Sunday’s for nursing hangovers and doing the English essay that’s due in the next day. When I was younger I used to hate Sundays with a passion, and to an extent I guess I still do. I think the detest I felt toward a day that made up half the weekend was instilled by my hatred of mass. Now I realise it’s actually not that bad, but when you’re a child every minute that you have to sit still feels like an hour. For some reason, I just HATED mass. I can’t describe it, I just did. So I always associated Sunday with mass, and never looked on the bright side (that I didn’t have to go to school). I was never one of ‘the plain people of Ireland’ either; thought I was way better than that y’see. Dinner in the middle of the day was a concept I could just never understand, and I couldn’t see why we had to eat potatoes and meat and veg at lunchtime, instead of having sandwiches or something, like we did every other day. Another thing I dreaded was the religious Sunday evening bath time. Like every child I hated it. Weekday bathtimes were never as bad as that one on Sunday evening for some reason. And so this disdain towards Sundays came with me as I grew into my teens. It was now ‘the day before school’ and a family day when you couldn’t really go out. Dinner slowly came to occur later and later in the day, and today we eat at the lovely time of 6 o’clock. If we do happen to go to mass (which occurs far less frequently), it’s always on a Saturday evening, and we go to Kinsale instead on a Sunday morning for coffee and a walk on the beach. It’s interesting to look back and see how some things have changed over the past 10 years or so. Not just in my life of a Sunday, but in Ireland in general. For me, I now have dinner in the evening, considered a more modern time I suppose? Whereas down in Tralee, my mum’s mother and the few aunts who live there still have ‘Sunday lunch’ as far as I know. I think why I hate ‘dinner in the middle of the day’ so much is because it seems to tie you down or something? Like my mother for example, she has to do the whole family-seated-around-the-dinner-table-as-a-bonding-thing, so if it was spuds and lamb at 2 o’clock round here I couldn’t be spending the day in town. Or maybe I just associate that Irish custom with my childhood Sundays and pre-Celtic tiger Ireland? I can’t say for sure. Sundays now are far more relaxed. 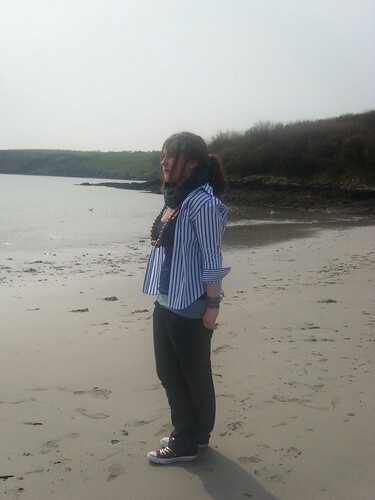 I love Kinsale, alot, so going down there makes me happy. Then I’ll do homework or play tennis so it ain’t half bad. Maybe even a jamming session over in Aisling’s house if we’re feeling like it. If not, I may spend the day on the laptop. It varies. There’s still the ‘Ugh tomorrow is Monday’ feeling, but not to the same extent. The way the country has evolved also changed the focus of Sunday from a religious, family-orientated day to a ‘chillaxing’ day. Shops are open on Sundays, and it’s now, more than ever before, just like any other day. The traditional Sunday is a thing of the past, and it’s for the better methinks. I just hope a recession doesn’t revive any poverty-related traditions. We’ll just have to pray that doesn’t happen I guess..!